Are your kids interested in learning more about musical instruments? Magic City Music Academy is the perfect music school for them! We offer fun-filled classes to students in Birmingham, AL, including orchestra, keyboard, and drum set lessons. If your children are interested in any of these classes, our Kids Orchestra Program is the way to go. The Kids Orchestra Program features three classes: Kids Orchestra, Kids Keyboard, and Kids Drum Set. We are currently offering classes to the following schools: Harris Early Learning Center, Levite Jewish Community Center, New Hope Pre-school, and Ephesus Academy Child Development Center. Kids Orchestra is a unique music class that teaches children how to create, play, and perform music in an orchestral setting. Students learn how to play instruments such as xylophones, metallophones, glockenspiels, timpani drums, Indian drums, snare drums, and handbells, and perform them together like a small orchestra! Who is Kids Orchestra for? The class is designed for ages 2 to 5 and there is a place and an instrument that is compatible with every child based on their individual skill level. The class meets for a 30-minute session once a week at your child’s school. Check with your child’s school for the exact day and time. The class can accommodate up to twenty students at a time. A music performance is held twice a year! The cost of the Kids Orchestra class is $35.00 per month. There is a $20.00 registration fee. Music fees are due on the first of each month and can be paid monthly or quarterly at your child’s school or online. Let our multi-awarded music professional bring out your children’s full potential! Magic City Music Academy offers the Kids Orchestra Program, which includes weekly orchestra, keyboard, and drum set lessons at your kids' school. We also offer voice, drums, and piano lessons to elementary and middle school students at affordable rates. Contact us to learn more about our music programs. Keyboard lessons are offered to pre-school kids aged 3 to 5. 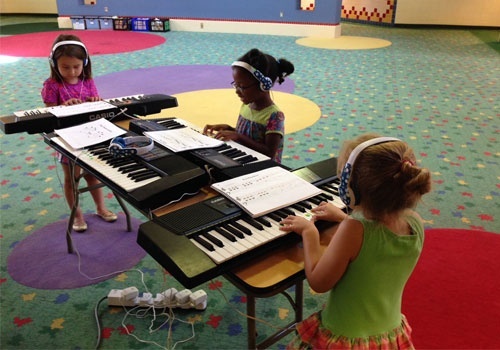 The Keyboard Class helps students develop self-discipline and self-confidence! Also, it’s an excellent way to help students learn how to focus and pay attention to small details while learning a valuable musical skill! Students learn to play six songs in Book 1 and six songs in Book 2. A music recital is held at the end of each school year! The Keyboard Class meets for 30-minutes at your child’s school. Check with your child’s school for the exact day and time. The class can accommodate up to four students at a time. What is the cost of Keyboard Class? The Keyboard Class costs $60.00 per month, including all books. There is a $20.00 registration fee. Music fees are due on the first of each month and can be paid monthly or quarterly at your child’s school or online. 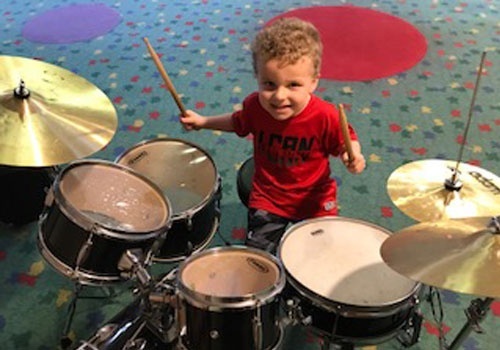 The Drum Set Class is the perfect class for the little drummer in your house! Students, aged 3 to 5, systematically learn how to play the five-piece drum set. The course helps develop eye, hand, and ear coordination. Students learn basic drumming techniques while playing several cool songs! The class meets for a 30-minute lesson once a week at your child school. Check with your child’s school for the exact day and time. What is the cost of the Drum Set Class? The Drum Set Class costs $60.00 per month. There is a $20.00 registration fee. Music fees are due on the first of each month and can be paid monthly or quarterly at your child’s school or online. All music students are required to purchase a music tee shirt that is worn at all musical performances and recitals.